This recipe is worth giving a go to add some flavour to cooked hot and cold meats. The red onion gives the chutney a lovely pink colour and the flavour is quite unique. Sautee red onion, garlic, ginger and chili in olive oil. Peel and cut limes into small pieces. Discard the skin from 6 of the limes. Finely slice the peel from 2 of the limes, and add limes and peel to the onion mixture. 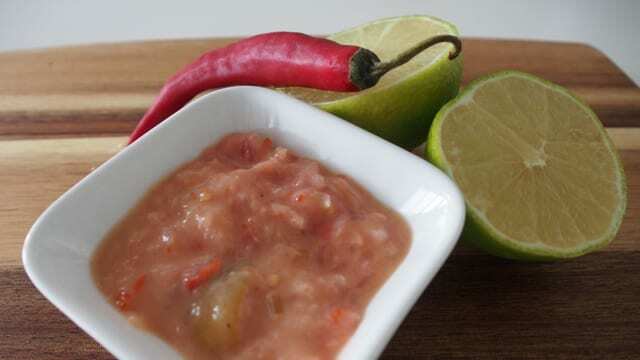 Stir until the lime flesh starts to soften and release its juices. Add cider vinegar, water, and Natvia. Boil this mixture until the lime flesh has softened. At this stage remove it from heat, and when cooled blend the mixture to break down the lime pulp. Place mixture in jars and store in the fridge.This chutney will last for several weeks.